Teenage Mutant Ninja Turtles is a theme officially released in 2013, although it was available in stores in some areas as early as December 7th, 2012. It is based on the Nickelodeon TV show that premiered on September 29th, 2012 in the US. Seven more sets were released in 2014, with three being based on the upcoming Ninja Turtles movie. 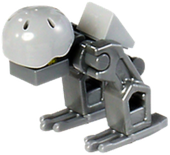 On February 12, Mattel acquired Teenage Mutant Ninja Turtles' construction line for MEGA Brands, marking the end of LEGO's license. Ninjutsu master Hamato Yoshi (Splinter) is carrying his four pet turtles through the streets of New York City when he encounters members of an alien race called the Kraang. During an altercation with these aliens, Hamato and the turtles are exposed to an alien chemical called mutagen and they undergo major physical transformations. Hamato Yoshi becomes a humanoid rat and the turtles become human/turtle hybrids. Splinter retreats to the New York City sewers, where he raises the four turtles as his sons and imparts to them his knowledge of ninjutsu. Now teenagers, the Turtles venture to the surface for the first time and learn that the Kraang is using the mutagen as part of their plan to take over New York City. The Turtles befriend the teenage April O'Neil after she and her scientist father Kirby are abducted by the Kraang. While Kirby remains a prisoner of the Kraang, April becomes an ally of the Turtles as they help her to find out where the Kraang have taken her father. The Turtles also learn that Splinter's long-time enemy Oroku Saki (Shredder) has ordered his Foot Clan to track down Splinter and his sons, and put an end to their clan. Although the theme was officially launched in January 2013, the sets have been available at Toys R Us, LEGOLAND, the LEGO Store and Shop At Home since at least December 2012 in U.S.A. 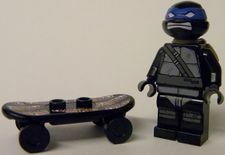 Most of the TMNT minifigures have molds that were designed exclusively for them. Facts about "Teenage Mutant Ninja Turtles"
This page was last edited on 13 January 2016, at 00:00.